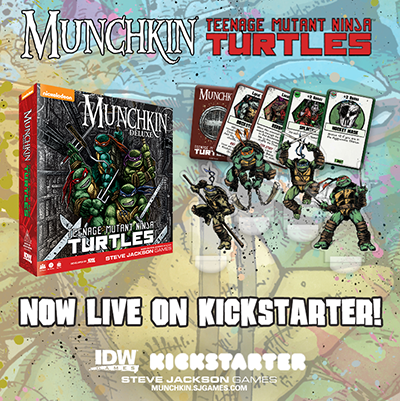 Daily Illuminator: Munchkin: Teenage Mutant Ninja Turtles Is Live On Kickstarter! March 8, 2018: Munchkin: Teenage Mutant Ninja Turtles Is Live On Kickstarter! Cowabunga, dudes! Munchkin: Teenage Mutant Ninja Turtles from IDW Games is out of the sewers and onto Kickstarter now! This new game features the Turtles, their allies, and their enemies, with art from legendary artist and TMNT creator Kevin Eastman. Players take control of their favorite TMNT character to get to level 10, but Munchkin: TMNT adds a twist: Team-up powers! Each character gets a bonus for teaming up with other players to defeat baddies. But ultimately, only one player can get to the pizza place first, so you have to know when not to team up! The Kickstarter campaign showcases a Deluxe edition complete with over 150 cards, a die, standies, a board, and even an extra character: Pigeon Pete! The Ultimate Deluxe features similar components, but has a duoshade tone and red bandanas on all of the Turtles (similar to the original Teenage Mutant Ninja Turtle artwork by Kevin Eastman). Or, you can get both with the Cowabunga bundle, which features an exclusive Kevin Eastman art print and a reprint of TMNT #1. It's a pretty radical deal! Retailers can also jump in with two different retailer levels for the Deluxe and Ultimate Deluxe editions. The project funded in less than an hour, and IDW Games shares new surprises and content on the Kickstarter page all the time, so now's a great time to back. Keep an eye out for more shell-shocking previews!